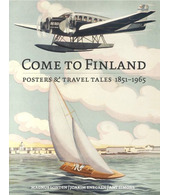 I became fascinated by the hand-painted typographies of the older posters when skimming the excellent Come to Finland -book. My starting point for the poster was working as the long gone artists did, by hand and without Photoshop. It was somewhat exciting to make everything look just as I wanted in such a large format. When painting on a large canvas, one is so very close and almost inside the painting, and one has to take a few steps back to consider the big picture. The object, a trip to the woods, is a traditional one but on a closer look the poster offers an entirely different point of view. 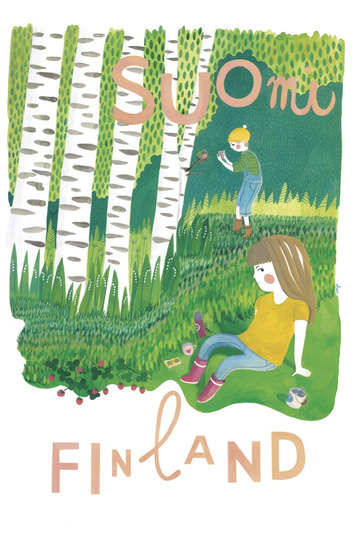 I, like most Finns, love the woods; picking berries, taking a break with coffee or cocoa in the thermos with sandwiches squashed and wrinkled in the backpack. The tradition of trips to the woods lives on although it is being slightly transformed by sharing the experience online. 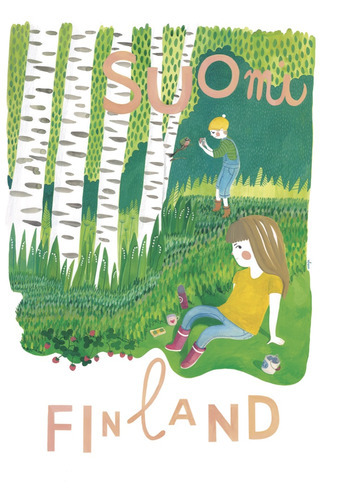 On the other hand the friends might be inspired to set out and explore the nature… No wonder that cross country skiing, berry picking and washing rugs are some of the biggest hipster trends of the day – at least in Finland.